If you’re going on a trip that’s probably never going to be repeated (let’s assume it isn’t for a job where you’d have to bring everything you could possibly need and spares) – what do you bring? The tried and true, or the new gear you think might work? And more importantly, how does one balance it out against the current draconian carry on limits, and one’s endurance in the field? After all, there’s no point in bringing the best camera only to leave it in the hotel…read on and see how my bag did in Havana. I made a very conscious choice to travel as light as possible and leave behind the tripod; it was a last minute change mainly due to luggage space challenges and a lack of foreseeable night/ long exposure photography. I erred on the side of caution with my load out. Havana is an expensive and long – 30h journey time on the shorter leg – trip for us from Malaysia; we’ve got to make it count. To top it off, at the time of leaving we had no real idea about safety etc. – leaving gear in a hotel room is generally a bad idea for obvious reasons, though you also don’t want to be a pack mule to your equipment. The reason for not bringing a complete E-M1 set for stills and video (we filmed a couple of episodes for the video workshops too) was because I also have the secondary objective of making Ultraprints out of my work – and 16MP is simply not enough for anything of size; an 8×10″ is about the limit. I also considered the Hasselblad and digital back, but given we’d be shooting under tropical sun, I’d either have to use NDs all of the time, or stop down heavily to deal with the maximum 1/500s shutter speed on the V’s leaf-shutter equipped lenses. The D4 also briefly came under consideration to give me some additional low light and tracking capabilities, but it didn’t make sense to carry two battery systems or the much, much larger charger. Finally, there was the Leica T prototype that remained in my hands following completion of the review. This had to be eliminated for the same reasons as the E-M1: not enough resolution, in addition to being a prototype: you really don’t want to take chances especially when there’s precisely zero local support for any brand. In the end, predictable and sensible worked: the kit let me make the images I wanted to make, and didn’t get in the way. And that’s about all we can reasonably ask from a camera, isn’t it? Most of the masterclass participants did the same thing: stick with the tried and tested, so that they might focus on the image making process rather than a camera’s operating idiosyncrasies. Performed very much as expected, except it seems as though the mirror calibration of the primary body had drifted slightly. An inconvenient (but at least doable) fix with the tools I brought along. More concerning was the occasional long lag and ‘hour glass’ delay visible when awaiting playback or powering up; it seemed to clear with a power or shutter cycle, and failing that, a battery removal. Other than that – nothing but the usual great image quality. The second body was probably overkill and saw no service at all the entire week. Update: Nikon has finally fixed this problem with the latest v1.10 firmware update a couple of days ago. Didn’t plan to use it – just as a body cap for the spare body, and to have something to shoot with in that range if the Otus packed in (as unlikely as that may seem). My impression of Havana as a physical location is that it’s either very tight (poorer and historical areas) or very long/ wide (think grand boulevards and avenues) which meant that I’d probably have to bring a telephoto of some sort. The 2/135 APO is an outstanding lens, but quite large/ heavy and not so easy to focus; given that one of my personal objectives was to try my hand at car photography, a manual focus lens was probably not the best choice for the trip. In the end, the 70-200/4 was chosen and purchased over the f2.8 II for size and weight, in addition to a lack of focus breathing and much reduced 1m minimum focusing distance – and it’s stellar optics and rock-steady VR, which must be one of Nikon’s current best features. The lens handled very well – like a slightly long (but not heavy or overbalanced) 24-70. In fact, it lived on the main D800E body most of the time – 70mm isn’t much longer in practice than 55mm. I found it to require some fiddling with AF fine tune to get a setting that would work optimally for both ends of the zoom and at all distances; it appears that there is some field curvature and variation in focal point as you zoom. Nevertheless, one of the few times I’ve bought gear specifically before a trip, and one of the even fewer times I’ve come away very impressed. In short: I didn’t land up using or carrying it because I had the GR with me, and that was just easier to carry, deploy and use off a belt holster than playing musical lenses (especially not in some of the very dusty or sea-sparayed conditions we encountered). I’d leave this behind next time. I found the focal length to be somewhat in no-mans’-land for the trip – which is definitely not a mark against the lens, but which certainly reduced its utility. The few times I did carry it, it of course produced the usual stellar images. However, the more I use it, the more the hood annoys me: it’s too easy to ding/ dent the edges, and really needs a rubber bumper on the end. Harvesting what is probably the world’s most expensive sea salt – I’ll serve it at a photographers’ dinner one day: Cuban, grown on the front element of an Otus. Note: make sure you wet/ dab the front element first to dissolve the crystals before attempting to polish it, or you’re going to scratch it. Badly. The Otus is fine, by the way. Though its primary purpose on this trip was video, my partner did use it for some stills; image quality post-EFC firmware update is definitely a notch up on what we had previously. It still remains our choice for handheld video work because if its excellent stabiliser and very low profile. A versatile lens with excellent optics; good for both stills and video (thanks to that manual override clutch with hard stops at either end). Weathered sea-spray pretty well, too. Same comments as for the 12-40: no other contenders for this purpose and field of view. I love the way the 307 looks, and the fact that it isn’t a Hadley Pro, but it’s quite limited in capacity – between one D800E/Otus, the 70-200, 2/28, laptop, and some spares, cables and ancillaries, the bag was full. I think I need a bigger one next time. The Hadley Small was a good walk around bag when I wanted to carry more than one extra lens; otherwise I just used the Think Tank pouches. My choice unless there’s a Leica or CF slot involved; in which case you need to use something slower to avoid file corruption, or take advantage of the faster bus speeds respectively (Lexar 1066x are a good place to start). I honestly can’t tell the difference in feel between the latest Intuos (Bamboo replacement) and the older Intuos3/4 tablets – they’re that good. And lighter, smaller and wireless with touch capability to boot – what’s not to like? Only one problem, and I suspect it was a computer hardware one – at one point after using Air Display to mirror the screen on one of my iPads, the tablet didn’t read at all – it recognised it because the power light was on, and the activity light blinked when the pen touched the surface – but there was no cursor movement. Odd – but thankfully solved by a restart. A couple of pouches to hold a large lens and iPad mini/ voice recorder respectively – no radio mikes this time meant that I was carrying all of the audio gear on my person. And me not wanting to carry a bag – most of you know I much prefer camera in and and a jacket with pockets – meant that I’d have to find a solution for the portions when we were filming. These two pouches worked a treat. « Announcing H2 2014 Workshops and masterclasses – now open for booking! After reading your equipment check list (and many of the readers comments), it’s gratifying to know that I’m not the only person to contemplate what equipment (out of my way-to-plentiful supply) to bring along on a major trip (pack mule vs. Tinker Bell with a Go Pro). Unlike you, I no longer work and don’t have that aspect to cover, but I still want a camera & lens combo to match the anticipated opportunities. You’re insights are very cool and appreciated. I’ve got an Alaskan outback trip coming up… after reading your insights, I’ll go back to square one and ruminate some more on landscape camera and lens choices. I use an elastic wrist band (like the ones tennis players use) as a hood pullover, protecting the sides as well. If you let it droop a bit at the business end, it will protect the edge without vignetting. Had the same issues hand-holding my 200mm Tele-Takumar. Problem solved when I wrapped its hood with a Nike wrist band even in storage (except when the band is wet). If you want to protect the edges only, a car door edge strip protector, cut to size, will do the job. I recommend the rubberized “L-type” strip which comes with a non-marring 3M tape; the “U-type” strips contain messy glue which melts under the tropical sun. The premium ones made in Germany or Japan will do justice to the Otus (available in 1m pairs or rolls in black, chrome, or colored; forgot the brand). Hope this helps (first comment from a long-time reader). That’s a great suggestion, I’ve been busing electrical tape. Thanks! Thank you for the effort, it’s always great to see behind the curtain – much appreciated! One question, I am pretty much set with my kit list for my trip to Nepal later this year. One last thing I’m trying to wrap my head around is whether or not to take my 15″ mbp + external HDD. This will effect a few things like the specifications of my bag (I will have to carry it constantly) and my reliance on a power source (over and above charging of camera batteries). My question to you is, would you ever be comfortable going on a 2 month trip without having a means to reliably backup your images as you went? Battery life on the latest mbp is, mercifully, a lot longer than you would have on your mba so I’m thinking I could go a few days without a charge (just transferring files at the end of day and maybe some minor editing if I can’t resist). Would you feel comfortable with a single point of failure solution ie. multiple memory cards? Thanks in anticipation. I hope you are finding the answers to the personal, professional and creative dilemmas you’ve had of late. Short answer: no. Realities of business and running this site mean that I won’t ever be able to go on a trip longer than a week or two, and I’ll always have a laptop if I’m gone for more than a day. If that wasn’t already the case, I probably would go with the laptop anyway, or at very least use the dual-card RAID function in my cameras. Travelling light? Five cameras and seven lenses? Half of that would be plenty. For me travelling light would be one body and one lens, plus the GR. But I suppose you need to look the part, running a workshop. It has nothing to do with ‘looking the part’, and I resent that. I could teach a workshop with my iPhone, and those in Prague will attest I did just that. It’s about ensuring you can make the images you want if you’re in a situation where you have no chance of getting backup, and you are also filming video. Two of those cameras were carried by my partner/ videographer, and I carry a lot less if I’m going to a country where spares are available. That cannot be said of Cuba. I don’t think you’d want to make the trip of a lifetime only to have your cameras fail. It can and does happen. For sure, backup is important. More so when travelling and even more so when in remote location. Still, five bodies for travelling light sounds a bit overkill. Why not one system that can work both jobs? So that one backup would cover both video and stills? Ie. Nikon for both stills and video so that one set of lenses works for both and if you really need an extra backup you would have a main still body (800), main video body ( whatever, if 800 is not suitable for that, I do not know Nikon line) and one suitable extra body that can cover both jobs in a pinch. I did not mean the comment on looking the part in a bad way. Sorry for that. But thinking purely from participants view, I think many of them would feel short changed if you did show up just with an IPhone. Unless it is an iPhone workshop. A Doctor is absolutely not any better or worse if he wears worn out jeans instead of his white coat and stethoscope, but the patient feels better and that is also important. That is why they always wear white coats and paid wedding photographers used to have Hasselblads. It is part of the respect for clients. But it absolutely has nothing to do with skill. I hope this helps put my admittedly flippant comment in right perspective. Because that one system does not exist. You can’t shoot low-profile handheld video with the D800E, and you can’t ultraprint with the E-M1. And don’t suggest the A7R, because the lens options are pathetic. Actually, I’d look at it another way: if I can produce images of my usual standard with just an iPhone, I’d say that’s even more impressive than turning up with three Hasselblads. Would you rather learn from somebody reliant on their equipment, or from somebody who can demonstrate that compositional and output skill transcends equipment? That’s the thing. Your standards are much higher than what the iPhone can produce. And rightly so. It can do pretty good video. It is better than most digital point and shoots some three years ago. But you did not travel to Cuba with just a pair of iPhones. I don’t know Nikon lineup. But are you saying that Nikon has no body that can do low profile handheld video? Maybe so. Of course you are free to choose the equipment you like and what you have is important part of the decision, instead of buying something you don’t already have. I was only thinking as general advice to readers, bringing five bodies on a trip would not be the suggestion I would like to put out, especially as an example of lightweight travel. I don’t want this to sound like an argument because it was never meant that way. So I will stop at this. Happy travels and keep up the good work. I am off to Vietnam. Actually I did have a pair of iPhones, but that was for communication and to keep business and this site running without a decent internet connection. Nikon and Canon both have no body that can do low profile high quality video handheld. We’ve looked, evaluated and tested just about everything currently available and not found any other options. I agree though: bringing five bodies isn’t a good idea. But it depends on your objectives, and mine are both pretty clear – and ultimately beneficial for the readers here (I surely wouldn’t film a ‘how to see’ video for myself). There’s no way I’d go on a beach holiday with five cameras, nor would I ever do an assignment with an iPhone. Being professional is getting the job done, with the right tools. Thanks for a very useful article. This kind of tips are so good to get. Super! Always fun to read these bag assessments and to theorise over the perfect setup! I was wondering – would the 645Z have been suitable for Cuba? It seems you used the 70-200 quite a bit – is there something suitable for the 645? Also with shooting cars – I guess would be also much easier with the D800E and likely needing to bring the tripod along as well? Yes – I wished it’d arrived in time, actually. For the 645Z, there’s the 90/2.8 SR, 150/2.8, 200/4, and 80-160/4.5; being equal to 75, 125, 165 and 65-135 respectively. Lots of choices. I don’t think we’d need a tripod; silly amounts of light (I was at base ISO almost all of the time, and hitting 1/1000-2000 at f8) and the 645Z’s high ISO capabilities would probably take care of things. I’m slowly acquiring them. I’ve already got the 55, 75 and 90; 200 is on the way. My 25/4 – used – arrived today; it’s clearly out of whack (won’t focus to infinity, very bad astigmatism) so it went back. Shame about the 25/4 – now that truly looks excellent. I think you’re going to have to ‘go on vacation’ for like two weeks to put the 645Z through it’s paces. Not seen you this, dare I say it ‘excited’ about a camera for a while, may almost be worthwhile! Yeah. All the samples/ reviews I’ve seen look excellent too; I think I just got a dud. I admit I’m actually now having the rational counterpoint thoughts to whether it was a smart thing to do or not – too bad given I’ve now got a lens commitment. As for a vacation – that would be nice, but if I’m testing a camera and writing, that’s work! Rationally it isn’t that smart, I mean the D800E is way more than enough! BUT if you’re chasing something more in the Ultraprints and also wanting to try something totally new I think it’s worth giving it a go – worse case scenario I doubt you lose too much if you have to sell it up. Only thing is you’d be running 5/6 systems? All have their own validity to stay in your stable, so that may be a bit of an issue. The D800E is way more than enough UNLESS you’re Ultraprinting, in which case, it’s on the lower end of sufficient – and that’s assuming your lenses and technique are up to it. Right now there’s Nikon F; Hasselblad V – somewhat interchangeable with the 645, and I’ve sold the CFV to one of my readers*; P645 and M4/3 for video. *I was initially looking at a Phase One IQ180 to replace the CFV, but then the P645Z came along…with enough shooting envelope to be able to do handheld stitches a-la-D800E. And at about a tenth of the price. No brainer, even if I have to buy two and join them together. Testing and writing is definitely NOT a vacation. There’s a lot more work and scientific method involved in producing a valid/ usable test report than most ‘reviewers’ realise – you have to do the quantitative, repeatable tests, and the artistic/ subjective ones in a meaningful way. I’m happy to hear you have secured a 645Z to review. Enjoying the camera? I’d be very interested to hear about how your hasselblad lenses perform on the body and how easy it is to focus them. I think that some of the manual focus screens (the 645n and newer ones) work on the 645D without affecting metering. Maybe they will work on the 645Z too. Also interested to hear how the older 645 lenses hold up to the new sensor. I’m still considering selling the majority of my equipment to simplify my gear lineup and moving to a 645Z with my hasselblad lenses (55 / 80 / 150). I think I would add the weather sealed new 55mm 645 lens too though. The other new lenses at ~$5k each are just too expensive for me. Side note – are you going to be able to get a review copy of the new rx100? I think you must have misread that. I’ve ordered/ purchased a 645Z for my personal use; there’s a 645D on loan for me to check the lenses I’ve already purchased. However, I think this body has some calibration issues – AF is way out of whack, and results are inconsistent. I’ve mounted the lenses on the D800E – with smaller pixel pitch and all – and they actually look a lot better – excellent, in fact – than on the 645D. Go figure. The Hassy lenses are pretty good too; some like the 120/4 have more resolving power, others are about the same; all render slightly differently. Bottom line, on a new, factory-fresh body that hasn’t been banged around as a demonstrator for the last four years, I’m sure they’ll be just fine. No need to buy new lenses – the old ones appear to be just fine (and much, much cheaper, too). That said, the 90/2.8 SR is pretty awesome. RX100III: Sony Malaysia are pretty useless. The chances of me getting anything to review from them are precisely zero. When the original RX1 was released; I requested a review loaner and gave up chasing their empty promises after one year. While it is a relief that the lenses work well on the d800e, it is definitely a shame that the AF is out of whack on the 645d. I’m sure they will all be fine on the 645z though, as you stated. Really looking forward to reading about your experiences with the camera. I may go stock up on some older 645 lenses before the prices shoot up. On behalf of all of your readers, I’ll shake a grumpy fist at Sony Malaysia. They should definitely give you a review copy. I hope it’s a justified congratulations when the thing actually arrives…as cheap as it is for MF digital, it isn’t at all cheap in the grand scheme of things. I’m pretty sure the demo camera has been abused – MF doesn’t agree with AF, there’s no easy way to calibrate the mirror, there are a couple of marks on the body that look like impact damage, and the whole thing smells like stale cigarette smoke. But that’s not the point; I just wanted to validate that operationally the camera would make sense, and fortunately, it does. There are things I like about it more than the way the D800E operates; most of it is comparable, and it’s streets ahead of any of the other MF digital systems in its level of integration (if not necessarily camera-ness, the CFV is still better that way: you treat it like film because the digital controls are so poorly done). The older 645 lenses are stupidly cheap. $300-400, perhaps 500 for the zooms! And it’s not as though they’re discontinued: they’re still available new, at 3-4x the price! By all means if you intend to buy the Z, then buy lenses first. Just make sure you have something to test them on as sample variation happens: my 25/4 has gone back to the seller because the whole thing was astigmatic and wouldn’t focus to infinity. No way i will carry all that, just bring my fuji x100 and x100s, i’m not a Sherpa !! Different equipment for different objectives. I can’t make Ultraprints from the Fuji sensors. I think for travel I’ve settled into the kit that I brought to Nepal, where I shot mostly street photography: D800, Nikon 28mm and 50mm f/1.8G, 16-35 f/4, and 70-200 f/2.8G II (the f/4 was announced a few months after I finally gave up waiting and bought the heavy/expensive one, but both are great lenses). A second D800 would be nice, but I brought a Minolta Autocord and a bunch of Tri-X and FP4 and I’d consider doing that again. I also brought a lightweight Feisol tripod that I didn’t regret having, and an old laptop that drove me nuts. The whole kit fit in a [very heavy] book bag. I’ll be tempted to add the 60mm Micro for the next trip, and maybe a Wacom if the trip is long enough. I find the 28mm to be a bit awkwardly wide and the 50mm a bit awkwardly long, but in both cases I think the photos are better than I’d get without the awkwardness, and this has helped me talk myself out of the new 35mm f/1.8G or the Sigma even though 35mm feels perfect. After a few days of being on the street shooting all day I got into a groove where I didn’t really have to think about the camera. It was just an extension of my hands. A couple things I noticed were that I was using much higher shutter speeds than I had in the past, usually at least 1/800 with the 70-200 and 1/320 with the other lenses (often 1/4000 from moving vehicles). Maybe it’s the combination of the higher resolution (motion blur sensitivity) and better high-ISO than my previous cameras, but the higher shutter speeds gave me much better results than I’ve gotten in the past. And, because I shot a lot at night and early in the morning, I found that manual aperture and shutter with auto-ISO worked really well when pushing the low-light limits hand-held, switching to aperture priority and auto-ISO to avoid overexposure as the sun came up. Even if you have perfect shot discipline, you’re going to find the D800 needs much higher shutter speeds than you’d expect. I was wondering if you have tried to “repair permissions” on your WD external using the “disk utility” on your mac. This is a simple fix that might smooth things a little. You also might consider purchasing a dedicated disk defragmenting program for Mac OS. While defragmenting will have little effect on your SSD powered Macbook itself, defragging is never a bad thing for physical hard drives. This might help with your transfer speeds as the WD is still limited by physical disk platters. As always, fantastic work. Yes I did – the drive is just full, down to the last 5%. It’s normal because the remaining space is inevitably not in the same physical position on the drive, but distributed everywhere which greatly increases seek times. I just bought another drive. They’re cheap, and with each project/ trip eating up about 30GB a week, necessary. Thank you very much for your nice report. Do you think that a D610 would qualify for the job, even considering the “ultraprint” needs, and perhaps with a little better ISO capabilities than the D800E ? Well, you’d get somewhere between 8×12″ and 10×15″. I don’t think high ISO is better, and it still has the AA filter which reduces pixel acuity. On top of that – frankly, I didn’t enjoy using the D600 body at all; it was just plasticky and cheap-feeling. In short: it would probably do the job to a limited extent, but not as well as something without an AA filter. I travel with with Leica rangefinders and I will be adding the Olympus OMD 1-E (or whatever the number). The DSLR is just too heavy and bulky. Packing tips: Break the cameras down by taking the lenses off. Then get cloth or other protective covering and stack the cameras in the bad. Lenses can go on other side and laptop can go in the provided pouch. I use a ThinkTank Urban Disguise 50v.20, which fits under the seat. You can’t trust getting overhead space anymore unless you fly business class. Wear a jacket even if it is hot. You can put chargers and a USB-powered hard drive in it. In my suitcase, I put a Gitzo travel tripod. I keep the head with me. Some photographers actually buy a cheap tripod when they arrive and throw it away before they head home. In my suitcase, I pack my underwear and socks in a day shoulder bag, which means I don’t have to lug the Think Tank around. I also pack a variety of filters. I’m always in two minds about breaking the cameras down – if you do, then your opportunity to grab a shot spontaneously is significantly reduced. I actually try and pack everything in shooting configuration, or at very least, have the GR easily accessible. Seems stupid to buy a tripod then abandon on departure – it’s wasteful, and if the tripod is rubbish…doesn’t it rather defeat the point of having it at all? I just breakdown for the air flight. As for tripod, not my way of doing it, but I found it kinda interesting that someone was doing that. So, assuming no ultra-prints, your revised kit (for this trip) would be the EM1 and Ricoh GR…? Just out of curiosity, how big do you feel comfortable printing from the EM1 or GR, assuming no ultra-print capability? (I am frustrated that the GR seems to be one of the few APS-C products, which milks the APS-C “sweet spot” (image quality vs. price/value vs. size). In regards to the Macbook Air, my suggestion is to wait for the 12″ version that is coming out later this year. Theoretically, it should have a Retina Display. The GR will Ultraprint to 8×12″; the E-M1 about the same. The trouble is that I know I’d want to go bigger, and regret not having the capability to do so. In future, I’ll probably be travelling with a 645Z setup. Frankly, Ming, you should really take a close look at the 2.3 GHz MBP Retina 15-inch, with 16GB RAM, with at least the 512 GB ssd, plus (underlined) the NVIDIA card with 2GB of VRAM. It’s what I’m typing this on. And I put a lot of thought into the investment. You will be relieved of so much frustration that you won’t know yourself. Your spouse may even notice a change in your mood! It costs about the same as a couple of cases of XO. And it could be better for you. I did. And the weight put me off; there are times when I’m on assignment and have to carry the laptop with me. As light as the 15″ R is, it’s still a lot heavier than the 13. I’ve got more than adequate horsepower at home already, and mostly adequate horsepower on the 11″. Can’t really relate to the XO since I don’t drink…but I have no doubt it would probably be much better for me. The other thing to consider with the Air vs. Pro is that the Pro’s power supply is significantly bigger and heavier than the Air’s and that may be important if you’re near the weight limit. I’d be happy with a maxed-out 13-inch Air, and it’s only the promise of the Retina Air that’s keeping me from buying one. I’m still editing with a 2008 MBP with a Core 2 Duo, but I don’t have high-MP images to deal with. John, why the underline on the NVIDIA card, with 2GB VRAM? An 8Gb MBA plus a thunderbolt display is my other option. It would actually be my favorite option, but I don’t think it’s future proof enough for me—there may come a time when I’m throwing digital medium format RAWs at the thing. As for the display, Apple displays are hideously glossy, like a mirror almost, that’s one thing… the other is, we’re already on Thunderbolt2 but display hasn’t caught up and it simply has to soon… with 4K popping up now (Mavericks supports it, I understand) I can’t think of a worse time to go out and drop 86,000 JPY on a Thunderbolt display [though the display itself seems perfectly decent]. All I know is the late 2011 4Gb MBA I have now is creaking; the worst of the worst is 16Bit per channel TIFF 120 scans, @ 3200 dpi resolution it takes Lr a full 10 seconds to render the files, at least 3 seconds on every zoom in… 6400 dpi output files just immolate the system. I’ve had enough and I’m prepared to make the problem go away with money (my company’s if I can help it). But why do we need the NVIDIA card? I was breezing through the MT comments as usual and saw your comment. Seeing as I just did what you are doing now I figured I’d share what I came across and what I ended up with. From everything I read (bear with me, as what I read and what my brain retained are two different things!) the NVIDIA card was not necessary for LR or PS. PS does make use of the NVIDIA card for a select few tools, I could be wrong but one such tool was liquify. But for the PS work flow laid out in the MT tutorials I do not think any of those tools benefitted from the NVIDIA. So from what I was able to read and understand (understand being the key part) the Apple graphics card is more than sufficient. Now to throw a wrench in the works……. So I ended up buying the 15in MBPr with the 16gb and the NVIDIA. WTF right!!?? Well it’s never quite that simple with Apple and the optional upgrades. I knew I absolutely wanted the 16gb ram (this to me was a no brainer, there is no upgrading after purchase.) I was looking at the entry level MBP with just the 16gb upgrade. With that option selected I was $400 away from the NVIDIA MBP. The other thing I was on the fence about was the 250GB HD. These days 250GB goes fast so I was hesitant to settle for 250GB. 500GB just seemed to be more breathing room. So add that on to the base model and now I’m only $100 away from the top of the line model. If you continue up the upgrade path and bump the processor up on the base MBR from 2.0 to 2.3 now I matched the top of the line offering in price and the only hardware difference is the NVIDIA card. Anyways that’s how I rationalized the extra expense. For me it’s also just a matter of “Well they are already into me for $2500, what’s another $100?” The only other thing I thought I’d mention that I ran across was that apparently there is software out there that allows the user to control the switching of the graphics cards. It was my understanding that for some tasks the Apple card was faster (I could be wrong here) and also the Apple card was more forgiving on the battery. I guess that’s just one more option to consider. All said and done, from what I read and understood the 15in MBPr with the 250GB drive and the upgraded ram (I think even the 8GB is sufficient) is more that sufficient for PS and LR. I just tried to “future proof” my purchase and spent a few extra bucks so I’m good for a bit. I hope it pays off. Hope that helps. I’m not the most tech savvy!! Hopefully there’s some other readers here who can provide a bit more quality info! Thanks for your input on the MBPr, Jeff. My research was pretty much the same as yours—bottom line, photographers don’t need the NVIDIA, the Intel Iris Pro (all other Apple options) is plenty. This was why I was interested in John’s comment above. For me, over the weight and processor power concerns though is display. Since I’m going to be opening the wallet up, it seems a cop-out to compromise on arguably the most important cog in the PP chain, the display. All the fancy horsepower and software is for nought if you’re not looking at “correctly” rendered data. This is the biggest pull of a Retina display for me; with a year and half under my belt with the 13″ MBA screen, I’m keen to work with something a little better. Packing for vacations has become so easy ever since I committed to a 35mm rangefinder. I simply throw my BessaR with 35mm f/2.5 Skopar lens and a brick of Tri-X into a backpack and I’m done. Look forward to seeing your images from the workshop. I was in Havana earlier this year. I took my D800e, 24-70, 16-35 and 70-300. As it turns out all I needed was the 24-70 for the Street Photography I was doing. The other stuff never left the hotel safe. I hope you can do one of your workshops on the East Coast of the USA sometime. Miami would be nice. They’ll be uploaded to flickr and presented here as curated photoessays in due course, much like my other travels. Personally, I found the midrange a bit of no-mans’ land – the 70-200 was very, very useful, in the end. As for east coast workshops – I did NYC last year, possibly again next year (and possibly Miami). It’s a long and expensive trek to get out there though, realistically I’ve got to be away for 3 weeks and a few workshops to make it worthwhile. The option to have workshops in different cities is a good one. Assuming NYC is one of them, flights to other places in the USA could be as close as an hour or two away, e.g., Boston, Washington DC, Miami. I know it’s tiring and a risk but as you say, it’s a long trek. One thing you might consider is seeing if there is any interest in one or two days of a film workshop, i.e., the requirement being a film camera for images. It might be something you could add on so that you stay in one place a bit longer which may be less stressful for you. 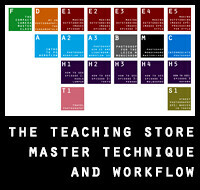 Film workshops have to run longer simply because of processing – the feedback process is much slower, and therefore the workshop cannot be as intensive. On top of that, if we’re going to do development and scanning, then I’d need to bring all of my darkroom gear over too – and that’s just impractical. So Jim, looks like you went on the week with Peter Turnley?! I’ve seen some of these images before. What did you think of it? I’m going to Cuba in Feb and doing a bit of homework. He has a week about that time but going to head there by myself. You are correct. If I went back I would be comfortable going myself. One advantage, however, of going with Peter is that he has been there many, many times. He’s gotten to know a lot of people and we were able to gain access to local places most tourist don’t get to. It’s not that you wouldn’t be allowed, it’s that you would never find out about them. Regardless, it’s a street photographer’s paradise. You’ll have a great time. Been through the same in the beginning of May when we decided to go for few days to Liguria, Italy. In the end I put my Hadley Pro and tripod in the main luggage and decided to use Kenti backpack as my in-cabin one – but what to pack? I knew I need ‘any-light’ camera, I knew I want high res camera. I decided that it would be shame not to try Leaf back and Hassy with 50/4 FLE. I’ve tried that combo only once in the field a couple of months ago (mostly due to bad weather). In the end one compartment of Kenti was occupied with fully loaded Hasselblad (50/4 + hood, 501 + Leaf and PME-51). The other compartment housed 150/4 lens and Fuji X-Pro1 + 18/2 lens. There was still space for one camera or lens…hmm… Of course! Must take small Sigma DP2M – pocket monster. And it wouldn’t be a trip without some analogue photography so I also took Mamiya 6 with 50mm lens and few rolls of Ektar. I really wish there was a camera like Sigma DP Merrill which can also be used on higher sensitivities (up to 3200) – I could happily just take that and a film body. Yes, for the same reason out of five days Hassy went out only once. I guess it’s time for me to find out how much I could sell Leaf for. UK price of 645Z + 55mm lens isn’t that bad. Would keep 150/4 lens and possibly 50/4 FLE. My 80/2.8 unfortunately is C version, I don’t believe it can be used with FP shutters. Can’t wait to read your review (using 645D now?). You are not using the Ultraprint process. It depends on both your threshold of sufficiency as well as the maximum real output resolution of your printer. Interesting to read about all the thought that went into your gear choice. Hope you will share more about the trip itself. Btw, why Cuba? Heard that, too. But their 2nd tier range is still top notch probably. Just guessing. So-so, it seems. Regular production smokes are easy to get, but the edition limitadas and the aged selection was zero. Thanks for the info on the Nikon D800(E) firmware upgrade. I frequently ran into the hourglass bug with my D800E (which, according Nikon, should be “rare”… uhuuh). I was under the impression it had something to do with certain brands/ capacities of SD cards. I’ll download and install the new firmware, and see if that particular problem goes away. Nice to see you are doing an article on your gear choices. Wise options, well justified and documented. It’s not rare, and it happens only on my older body – but not the new one. Both running the same Sandisk Extreme Pros and Lexar 1033x CF cards. Firmware update so far so good, hasn’t broken anything and won’t forget your custom functions or file numbering (the best news of all). BTW: Sea salt (or a comparable environment) would be the only one of two occasions where I’d use filters on a lens ( the other one being in need of a polarizer). Although I did wonder about that last minute inclusion of the Zeiss 28. I know it’s your favorite wide angle FL, but you already had it covered by the GR. Why didn’t you take your Zeiss 21? I would have loved to see some work with a more extreme perspective. My guess is you already figured that out yourself, given your statement on the GR 21 adapter. That still puzzles me though: the GR 21 adapter over a D800E / Zeiss 21 combo? I didn’t bring the 21 adaptor, either. There was no 21 at all, actually – mainly because of the size of the Zeiss 21 – I was out of space; that and I didn’t want ‘visual perspective novelty’ to dominate. Now I find the battery on the GR pretty good, I would expect maybe 300 shots out of one. How do you get 400? Are you turning it off for extended periods between batches of shots? Ah, right. Makes sense. I am so used to DSLR battery omnipotence that I haven’t been turning the GR off at all whilst out shooting with it. So my 300 shots per battery means 300 shots in, say, two or three hours of constant use. That said, I notice it’s possible to switch the LCD off and keep on taking shots, just judging the framing, which is nice (if hit and miss). What a great camera. I love it in a way I never felt about the X100s, which cost twice as much, attracted attention, had terrible battery life, and a sensor that made people’s faces look like they’re made of plastic. I don’t have a case yet, actually; what do you recommend? Why no radio mikes? Some weird regulation, or technical reasons? Weird regulation – the regime doesn’t want its citizens being able to communicate on the sly outside government channels…as for the 15″, it’s bloody heavy! The 15″ has definitely shed a few pounds over the previous model, but yeah, not the ideal travelling companion. I’m sure the 13″ is just as good where it counts though. It’s got a lot less horsepower, and integrated graphics only – so I’m not so sure it’s worth the premium in price and weight over an 13″ Air. I thought a lot about these two choices (13″ Air and 13″ Retina). I chose the Air for the longer battery power and portability. I didn’t regret it at all. I worked a day long besides someone with a 15″ Retina. Mine was not really slower. We were working in lightroom the whole day. Just make sure to order the full options (processor, RAM, storage). For me its all about the screen when I work in PS or LR. If its less than FullHD then its not really cutting it for 2014 laptop I think. I’m off to Cuba next February. Taking Mamiya 7 with 80mm (38mm) and as back up/in sling bag Ikon or M6 with 24mm Elmar…..Acros and Ektar in the bag….May even just go with Ektar and be done with it! Not really worried about day time light issues. Shooting early mornings and evenings only for most of time, though will have ND filter if required. Bring plenty of film. It’s not available at all over there, and you’re going to have even more photographic opportunities than you expected. Thanks for the tip Ming. Its 7 days and thinking I’ll shoot 220 for practical purposes and allow 5 roles/day. So 35 roles of film in MF or 700 exposures. M6 i’ll take 2 roles a day (14 roles @ 24 exp….all up). Goal is to try and come home with 10 images worthy of large prints for sale. What are your thoughts on that? The Mamiya is the primary camera for me. Thanks for sharing. Very fun read as we all go through the same exercise before leaving for a trip. I’m curious if the 12-40/2.8 has replaced the Oly 12mm, Pan 20mm, and Oly 45mm when you use the E-M1? Or do you still use the primes only when you want the extra stop or want a lighter setup? I use the 12-40 and 75mm. Blimey that’s a lot of gear to bring to a trip. I did the same thing last time I went travelling… though my stuff was significantly less expensive. I went with a 5D + Helios 44-2 58mm F2 (didn’t bring my Sigma 24mm F1.8 or Sigma 50mm F1.4 lenses I had back then because they are large and heavy), an X100 and a Kiev 88 with 2 backs, a 80mm F2.8 and a prism (and lots of film, of course)… used the 5D the least (though I guess at least in part because I just can’t stand longer focal lengths and 58mm is fairly long to me.. and I did get the best image from the entire trip from my 5D.. at least from the ones I’ve seen, I still haven’t developed the film, and it’s been a bit over a year, but I don’t think I got anything as good as that one image from the 5D and Helios 44-2 combo). Next time I’m gonna go significantly lighter… just my M2 and the 40mm Summicron. That’s all I need, really. But then again, I don’t make ultraprints (nor video, for that matter), in fact I much prefer the low resolution film look of an older emulsion of 35mm colour negative film to just about any digital output (or larger format film, for that matter). Which is not to say that digital or larger format output is bad or anything of the sort, just that sharpness and resolution don’t really matter to me, and small format film tends to have a strange look to it that I really like, more so than anything else. But all of that is beside the point. The more I shoot, the more I realise that bringing too much stuff (not just for trips but for shooting for yourself as well), at least when it comes to personal work, is fairly detrimental to the enjoyment of other things and to an extent, to the enjoyment of making personal work (can’t really say if the personal work actually suffers as a result or not, though). But that’s just a generalisation, one does still need specific gear for specific things, if other things literally cannot do the things one needs them to do. Still, something to consider, perhaps? That’s actually very little compared to what I bring if on assignment: there are no excuses for the client if you don’t have spares or something stops working and you’re in the middle of nowhere (technologically, at least). I have both and another advantage of the old one is a better working distance (90mm at 1/1 ratio). Both are good lenses. I use one of them to take flower pictures and others small things when I’m visiting towns and their gardens. 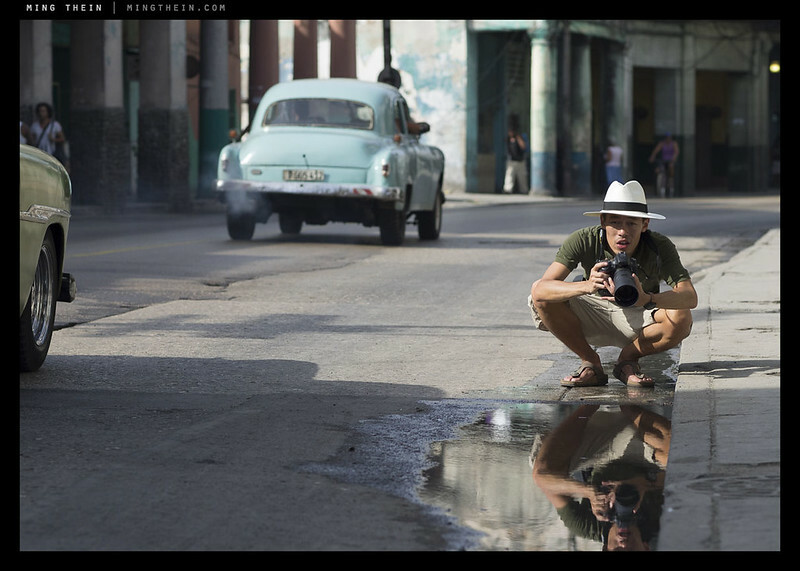 I was in Havana for a week last October and because I was interested in doing only street photography in the city, I settled on taking my light and unobtrusive OM-D EM-5 and leaving the D600 and D800 and associated heavy lenses at home. I took 4 primes: 14mm, 20mm, 25mm (those last two were a bit close and I used the 20 more than the 25), and the 45. I carried the camera, 4 lenses, and one spare battery loose in a lightweight canvas shoulder bag that I bought for $25 in an army surplus store. I had doubts about my choices the whole way there and my friends who were carrying heavy backpacks full of gear openly mocked me. But I couldn’t have been happier with the results and with how free I felt with so little gear to worry about. I’d have done the same, except the image quality isn’t sufficient for Ultraprinting. We were using one of the little Olympus things with another Sony as a backup, and the normal Rode capsule mics we usually use. Great post, Ming, as always! I leave for six days of fieldwork in Bihar, India, tomorrow. This post helps me as I pack my gear! Looking forward to learning and seeing more about your time in Cuba. Ultraprints from the 70-200, or just the Otus? Your GR + Oly setup is exactly my digital setup too when I want maximum freedom and versatility. It’s so simple. My film setup on the other hand is a fun disaster with 6 different cameras and 4 aspect ratios. From both, and the GR – but the GR will be size limited. I am very curious about the GR Ultraprint. Looking forward to seeing what’s offered! You still have the Leica M? I’d take (if I had it) a Leica M + 21mm +35mm, and the D800 with 70-200. Since I don’t, I’d take the D800 + 24-70 and 70-200, and an X100s or XT with a few small lenses. I don’t do video, though I’d like the Oly or Pana GH4 for that. I love the image with which you chose to lead this post. There are so many layers to it. Forgive me for not commenting on the more technical aspects of the entry.